New World Petaling Jaya Hotel made its debut today as the first Malaysia property for New World Hotels & Resorts. The stylish hotel is one of the tallest hotels in Petaling Jaya, conveniently located with direct access to major highways such as the Federal Expressway and North Klang Valley Expressway (NKVE) as well as in close proximity to the Kelana Jaya and Glenmarie LRT station to offer all the conveniences of the city at its doorstep and easy connection to local business and leisure activities. To celebrate the opening of the hotel with the community, an auspicious opening ceremony was officiated by Dato’ Lee Tuck Fook, Group Managing Director of WCT Holdings Berhad, Mr. Goh Chin Liong, Deputy Managing Director of WCT Holdings Berhad, Puan Rohaya Mohammad Yusof, Head of Private Markets of Employees Provident Fund together with Mr. Symon Bridle, Group Chief Operating Officer of Rosewood Hotel Group and Jai Kishan, General Manager of New World Petaling Jaya Hotel. “New World Petaling Jaya will be both a gateway and a getaway in the city,” said General Manager, Jai Kishan during the hotel’s opening ceremony. “It will be a welcoming, residential-style home base to conduct business and discover the area’s many attractions, the perfect venue to meet up with friends and professional associates, or a peaceful retreat to simply unwind and relax in style,” In celebration of the newly opened hotel, an in introductory opening package - “Style in The Sky”, which includes a buffet breakfast for two persons at Pasar Baru and welcome cocktails at The Lounge will be available from now until to 31 March 2018. Rates start from RM418 nett on weekends and RM438 nett on weekdays for double occupancy. 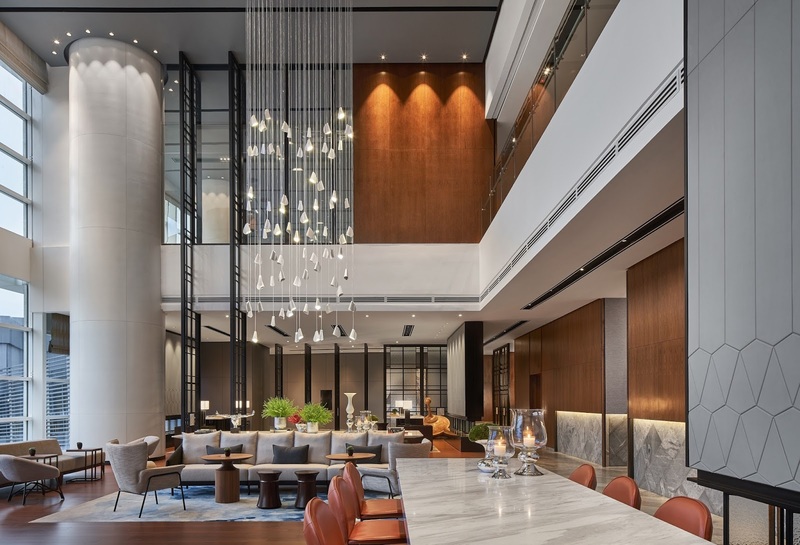 The ’WAU’ factor Instagram-worthy and delightful design details await each guest who walks through New World Petaling Jaya’s majestic entrance. Malaysian influence is present throughout the thoughtful interior design, a six-metre high “wau” (traditional Malaysian kite) sets an imposing structure at the lobby to the colossal 3 metre “gasing” (traditional Malaysian spinning top) sculptures and well-curated local artworks greet guests upon arrival. Contemporary guestrooms and suites with a local flair New World Petaling Jaya Hotel’s 300 guestrooms feature bamboo flooring to convey both tactile warmth and a feeling of spaciousness, complementing the contemporary design which includes sleek furnishings and marble-clad bathrooms to create an element of opulence. Be inspired by the unique Malaysian-themed artwork and design in every room for a sense of identity that is proudly Malaysian. Subtle and warm colour palettes of understated azure, in sync with mood lighting inspires your home away from home. 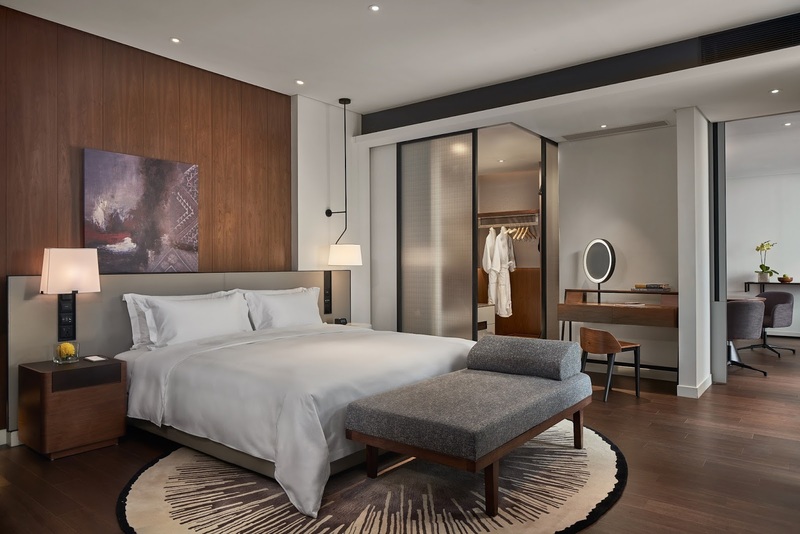 Generously sized, guestrooms start from 36-square metres for Deluxe to 73-square-metre suites. The 20 spacious suites will also feature free standing bathtubs. Residence Club rooms and suite guests will be provided access to the New World Hotels’ signature Residence Club Living Room which offers exclusive benefits such as complimentary breakfast, all-day refreshments and dedicated concierge service, as well as sweeping cityscape views. A culinary melting pot Pasar Baru restaurant will salute Malaysia’s multi-cultural mélange of Malay, Indian and Chinese flavours in a lively market style setting. Traditional mosaic tiles synonymous with the local Peranakan heritage adorns the walls of Pasar Baru creating a colourful and vibrant setting to elevate the local market experience tantamount with Malaysian culture. It will also serve Western favourites and make for a charming breakfast setting delivering fresh food from live cooking stations. 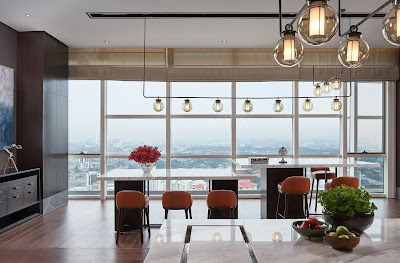 Set atop the 30th floor against expansive cityscape views, PJ’s Bar & Grill is the largest rooftop bar in Petaling Jaya fitted with a viewing deck perfect for capturing the city’s panoramic skyline. The sophisticated restaurant will specialise in Western and Asian grilled dishes, tantalising appetisers and creative cocktails accompanied by a private cigar lounge, scenically situated next to the outdoor infinity-edge rooftop pool. The Lounge in the hotel’s lobby is destined to become a favourite spot to catch up with friends or business partners. Sky-high recreation The 300-square-metre rooftop infinity-edge pool on Level 30 will offer refreshing swims and sunbathing, while the whirlpool will provide a relaxing and bubbly massage, all backdropped with a city panorama. A state-of-the-art fitness centre equipped with the latest treadmills, elliptical machines, stair climbers and free weights offer with sweeping views of the city is located on Level 29. Experiential, personalised and rewarding events The hotel’s event facilities will include a 1,700-square-meter pillarless grand ballroom capable of accommodating up to 1,000 guests. Experiential, personalised and rewarding events with bespoke menus and service excellence is the core of New Wold Petaling Jaya Hotel synonymous with the importance of aesthetics and flexibility. The stand-alone grand ballroom with its own entrance will add a sense of arrival and grandeur to any event, with the added convenience of also being easily linked by bridge to the hotel. The additional eight meeting rooms, all with abundant natural light, will be ideal for business meetings or social functions. Each venue is illuminated with functional reflective dimmers to evoke a sense of space with classic imprints of the Malaysian ‘wau’ adorning the walls to signify the influence of local charm. For more information and reservations, please contact your travel professional, the hotel directly at telephone +603 7682 0000, e-mail marketing.petalingjaya@newworldhotels.com or visit petalingjaya.newworldhotels.com.